The history of inflatable hot tubs actually goes back to ancient times, when bath houses and spas were built near hot springs. In ancient Egypt, only the King and other wealthy people were able to have hot tubs in their own home. Fast forward 4,000 years, hot tubs are much more popular and are enjoyed by common folk all over the world. People like them both for the benefits they gain and for social reasons. Some of the benefits of using a hot tub include; relaxation, easing muscle pain, and improving circulation. After a hard day at the office it would be great to come home and slip into your hot tub and let the stress melt away, wouldn’t it? Those achy muscles will relax and feel stronger in a matter of minutes. The benefits may be enticing; however, there are a few obstacles to owning your very own spa. Firstly, the cost; hot tubs can run into thousands including the tub and all the necessary hook ups. Plus there will be costly installation services and fees. Secondly, the space; not everyone has a deck or patio that can accommodate a hot tub. Plus, there may be weight limits to consider also. After all, water is heavy and you need to be sure your deck can hold the weight. 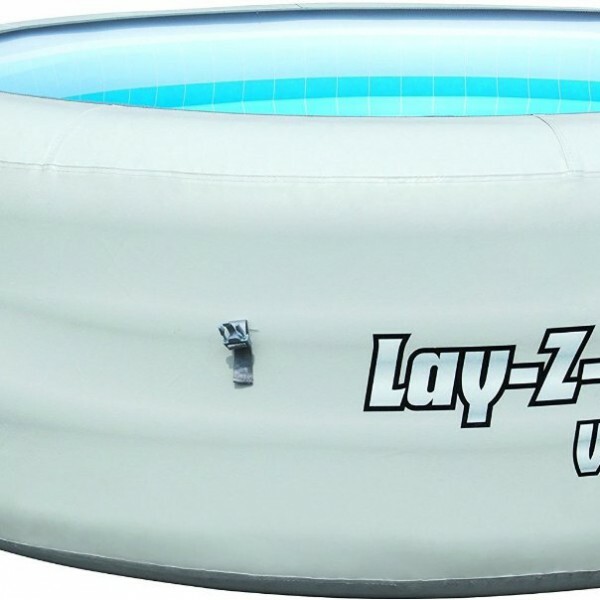 Today we are going to look at the advantages and disadvantages of an inflatable hot tub from the ever popular Lay-Z-Spa range, the Vegas model to be exact. The cost of this tub compared to conventional hot tubs is a fraction, close to only 10% of what a conventional hot tub would cost. This means that this particular product is something that the regular person can afford, instead of just the wealthy. 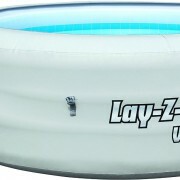 They Lay-Z Spa Vegas has a quad horizontal ring construction. This gives the sides the sturdiness of a hard-sided tub but retains the portability. 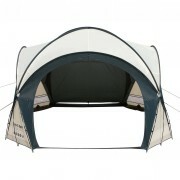 It is made of durable, rupture resistance materials. 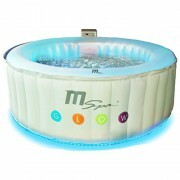 When you receive your Lay-Z Spa Vegas package everything you need will be included. In fact, it will only take a few minutes to have it set up and filling with water. The part is you can do it all yourself. There will be no need to hire a professional for installation. Easy to manage, this hot tub has the digital controls located on top of the pump/filter unit. The controls allow you to select the temperature (up to 40ºC) and choose the direction of the water flow and jets. There is also a timer unit that allows you to schedule when to turn it on and off. This energy saving feature allows you to set the time up to 72 hours in advance. It will take 12-24 hours to heat the water to the temperature you want, but instead of running the heating unit all the time you can set the timer for the heater to come on in enough time to heat the water to be ready when you want to use it. A filter system is included with this hot tub, as well as two filter cartridges. This easy to use system will help you keep your tub flowing with crystal clear water. Pool chemicals will have to be used. This system can use salt water chlorine as well. 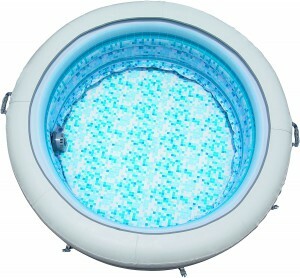 This portable spa has a remarkable 87 jets to massage and sooth your aching muscles. The jets come up from the floor border. There are no adjustable jets in the wall of the hot tub. This unit also comes with an insulated cover that clips down, a bubble mat floor protector and a set up and maintenance DVD. Everything you need to set it up comes with the package. Cup Holder – this drink holder sits over the side of the spa and is sturdy enough to hold two drinks. Pillow – the pillow also attaches to the side of the spa and will give added support to make your lounging experience all the better. LED Light – perfect for nighttime enjoyment, the floating light is waterproof, needs no external power source and has four fabulous colors. Floor Protector – the protector is insulated to help keep your spa warm, it will also protect the bottom of the spa from any debris. For those that want the luxury of a hot tub but don’t want to spend your nest egg to get it, this inflatable hot tub may be what you are looking for. 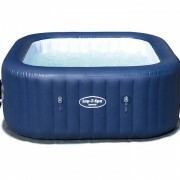 The Lay-Z Spa Vegas has many of the features of a conventional hot tub including critical items such as a pump/heater/filter system and air jets. It also has a safety feature in the cover that has double clicking locks making it difficult for small children to unlock and get in to. There are a few disadvantages that may be easily overlooked as they are not critical to the operation of the hot tub. Overall, this hot tub gives you the luxury of a spa experience at home for a fraction of the cost. 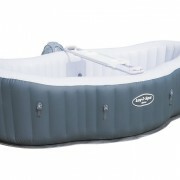 InflatableTub.co.uk is a participant in the Amazon EU Associates Programme, an affiliate advertising programme designed to provide a means for sites to earn advertising fees by advertising and linking to Amazon.co.uk.